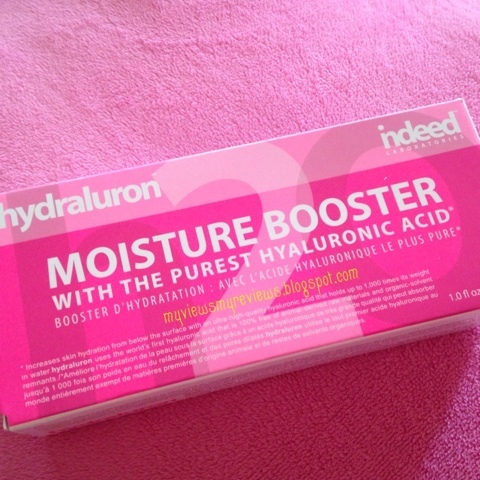 When I received Hydraluron by Indeed Laboratories, I was intrigued. 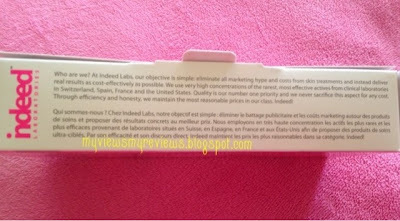 On first glance I liked the simple packaging and I liked its simple no-nonsense ingredients clearly stated on its box. This is a serum that will boost hydration. Filled with the purest form of hyaluronic acid, the serum is supposed to also give you anti-aging benefits. Really, I truly liked its packaging... Almost looks like my daily contact lens pack - slim and no-nonsense. At MUSE by Watsons, they carry 4 of Indeed Laboratories products which are Nanoblur (an anti-aging formula that's supposed to make you look 10 years younger) at RM65, Snoxin (touted to be better than a $500 serum for its effectiveness to combat aging appearance in skin) at RM130, Eysilix (treatment for the eye area) at RM99 and Hydraluron at RM80. All of them in similar simple yet attractive packaging but prominently labeled. According to Indeed Laboratories, their objective is simple, that is to eliminate all marketing hype and costs from skin treatments while delivering results as cost-effectively as possible. 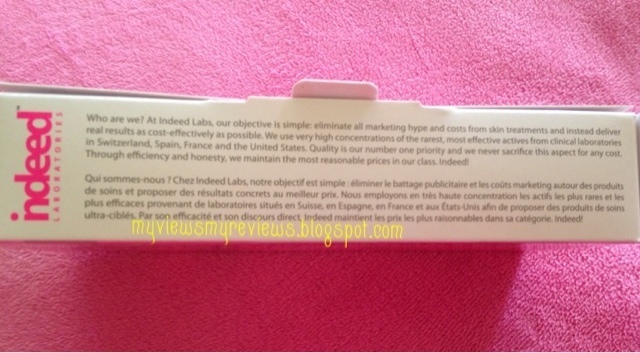 Their products use very high concentrations of the rarest most effective actives from clinical laboratories in Switzerland, Spain, France and the USA. They BELIEVE IN: next generation peptides, advanced biotech, uncompromised safety, factual science, hype-free communication, practical packaging and honest price points. They DON'T believe in: antiquated actives, mesmerising aromas, parabens SLS & siblings, high-gloss advertising, golden jars (with a spoon) and ballooned prices. See its down-to-earth ingredients list? No silicone content! The formulation is a clear gel-like texture which is instantly absorbed into the skin, there's no fragrance and made my skin really matte. It's as if I've used a makeup primer without the oily silicone-y feel. I used it for about a month, twice a day but didn't quite notice any significant change in my skin's hydration level. I did however notice that my skin is much softer and oil seeds were coming up to the surface of the skin within 1-2 weeks of use and could be extracted very easily. I had many oil seeds that were so stubborn and hard but they all seem to purge almost naturally from the skin and I was made oil seed-free! Despite all that, I still wasn't sure if it was this serum that made a difference to my skin or a new moisturiser I was using. So, I stopped for a few days and saw that my skin became rough and needed constant exfoliation the way it usually would. Because of this, I tried using it again but limit the use to only night time just so I could tell a difference in the way it works on my skin. That, made all the difference I needed and I realised that my skin did become softer. My pores were finer and friends did notice how my skin looked more radiant while skin texture improved. Thus, I decided that this is a serum I couldn't live without. 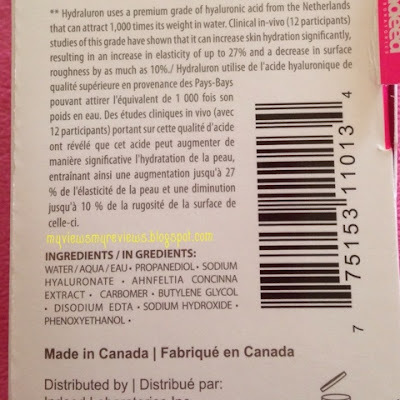 It didn't improve hydration in an obvious way - maybe not so much on the skin surface but it probably is helping my skin improve deep down because I did notice how supple skin feels when I wake up the next morning. During the day, I would use a different serum but if I have an event where I needed to put on makeup say for weddings or even that one live interview on TV that I did a few days back, I would make sure I use Hydraluron as my makeup would last longer and looked better.. Makeup glides on really smoothly and after awhile, the foundation will look so natural on my skin. After using this for about 3 months, I have now ran out of it, down to the last bit and I know I would want to replenish it. At just RM80 for a 30ml serum, this is a really worthy item, indeed. I've never been really impressed with any serums before. Yes, I would be happy with some of them but I don't recall ever repurchasing any serums once they run out. Possibly because they are just too expensive to repurchase but it's probably also because I would always have something new to try... perhaps it is also because they'd clog my pores once I would finish the bottle because of the silicone content (I think!). 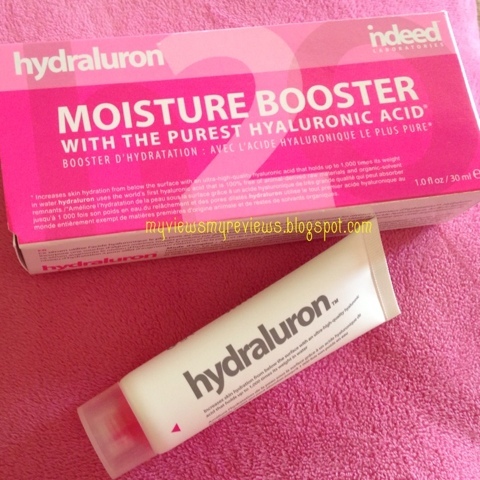 Hydraluron I guess is reasonably priced, works so well on my skin and so I'm making this my staple serum. The only thing is, this product can only be purchased at MUSE by Watsons, located at Sunway Pyramid. Have you dropped by MUSE by Watsons yet? well that is just good news for us, eh?